I am sorry it has taken me this long to discover these books! The Very First Christmas has been one of our favorite readings during Advent for years, it never occured to me there were more like it. Then, a few weeks ago I was browsing Amazon and there they were; a whole series of beautifully illustrated books, covering creation, the flood of Noah, even the story of Pentecost. The author does an excellent job of giving historically accurate information, weaving the Biblical story through the context of a young boy who is tired of fairy tales and wants his parents to only tell him stories about things that really happened. Scripture is used to tell much of the story, and while I have not read them all, the ones I have looked at seem to be compatible with Orthodox theology. If you are looking for another good book to read this Lent, or to tuck into that Lenten survival bag, this would be a great addition! nice! 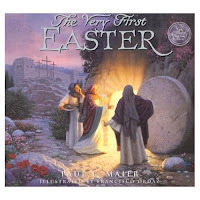 There is a three book series (smaller paperbacks) on Good Friday, Saturday and Sunday that are Orthodox... I saw them at the Holy Dormition Monestary but do not remember the author... just so you know these are also out there! so nice that there are some good books for kids still today!